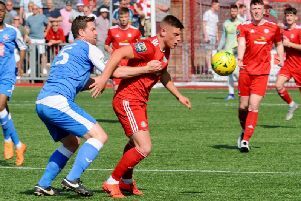 Sam Rents has committed to Worthing Football Club for the 2018/19 season. The former Brighton & Hove Albion defender, 30, signed a one-year deal with Worthing yesterday. Rents is another in a long list of players to have agreed on returns to Woodside Road next season. Jesse Starkey, Jared Rance, Reece Hallard, Darren Budd, Alex Parsons, Joel Colbran, Ruben Schneider, Rhyle Ovenden, Joseph Clarke, Ross Edwards and Kieron Pamment have all signed new deals while James Crane (from Bognor) and Will Miles (from Burgess Hill Town) have both joined Adam Hinshelwood's side. Earlier in the week, defender Henry Watson became the fourth player to leave in the close season, following Ben Pope, Harvey Sparks and Zack Newton out of the club.